Picture this. You roll up to a jobsite bright and early in the morning, hop out of your truck, slam your cup of coffee down on the roof of your service body just as the sun peeks over the horizon. You walk around the truck, mulling where you left your tool belt along the way, pop open one of your compartments and out comes everything including the new guy’s lunch from yesterday. Now, you get to spend the first 30 minutes of your work day in the twilight of morning rooting through a hodgepodge of items on the ground and deciding how or where you’re going to stuff them in order to start the day. How does that sound for productivity? Not good. Now, many of you don’t likely fall into the category of mass service body mayhem, but that doesn’t mean it’s not important to consider the benefits of keeping an organized work space. Simply owning a service body allows one to take advantage of the inherent storage advantages that come with it. Rather than just tossing things in the back of a pickup or van, a service body offers high-level compartmental organization to help you organize the stuff you need to get the job done. Many users keep most used items (toolbelt, essential tools) in the compartment directly behind the driver’s door where they’re easily accessible. Keep tools compartmentalized in a way that makes sense to you. Maybe you want to group them by tool type or job function, but make sure they’re in a place that makes sense to your vocation and current job. Small hardware items often times make sense on the curb side of a service body. Some of these items can be hard to find, so rooting around compartment shelves on the street side of the vehicle is never a good idea. Organization of these items is paramount! While compartments are a great option for keeping large items separated, safe and sound, even more finite storage solutions are oftentimes needed across all vocations. 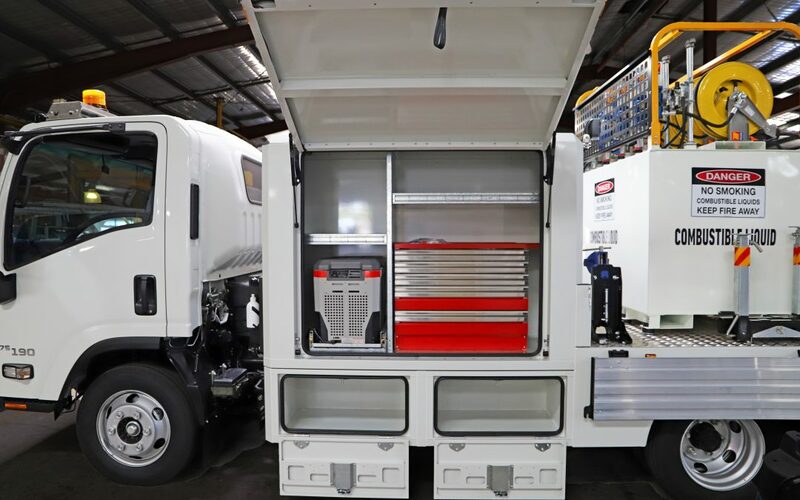 Storage solutions have become increasingly popular in recent years in both the van and service body industries, and they’re an extremely viable option to clean up the inside of your body. Keeping tools, hardware and other items in inner-compartment storage bins and boxes gives a neat appearance and makes things even easier to find. Find a method that works for your small items. Make sure they all have a place in the vehicle. The smallest items often rack up the largest amounts of wasted time. In lieu of inner-compartment storage solutions, additional shelves can help add storage real estate inside compartments. Don’t mistake vertical space for storage space. Filling it can be a double-edged sword, as stacking can create a cluttered, inefficient space. This is where additional shelving and storage solutions come in. Your parents may have told you, “Put it back where you found it!” Your service body should be no different. One of the easiest ways to maintain an organized service body is to consciously focus on returning things to their respective place when you’re done with them. Keeping an organization routine at the start and end of each day is a great way to ensure you spend minimal time on the clock searching for the tools you need. If you just can’t gather the time before or after your day, it’s important to schedule regular TLC time for your service body, including organization needs. Whether it’s weekly, monthly or beyond, time spent organizing your vehicle can exponentially increase time on the job. Keeping an eye on service body organization can do a lot of things, but none may be more important than the way your business is presented to customers. We’ve talked about the money you may be losing through inefficiency in the field, but don’t forget the business you could be losing on the front end. Let’s imagine someone pulls up to bid a project on your house with a haphazardly organized truck. Ladders are half fastened down, compartments are overflowing and the vehicle is a mess. This might say, “sloppy, inefficient and expensive,” to a customer. At the end of the day, the most important thing is that you have a system in place that works for you. Organization and standardization can increase job site productivity and give your truck a professional appearance, but it can be a lifestyle change. Whatever system you decide on, remember to never settle for a disorganized work vehicle!